"Sponge cake is soaked in coffee syrup then layered with coffee and espresso ice creams for an elegant, frozen dessert." In a small saucepan over medium heat, combine sugar and water. Bring to a boil, then remove from heat and stir in espresso and coffee liqueur. Let cool completely. Split the sponge cake in half horizontally to make two layers. Place bottom layer in a serving dish. Brush with 3/4 cup coffee syrup. Sprinkle 2 tablespoons ground espresso evenly over surface of cake. Beat the espresso ice cream with the paddle attachment of an electric mixer until spreadable. Spread over bottom cake layer. 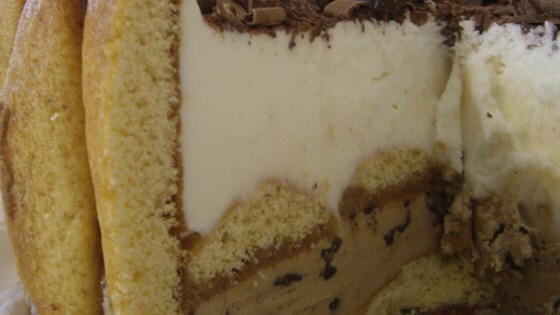 Place the top cake layer over the ice cream. Brush with remaining coffee syrup. Place in freezer 30 minutes. Beat the coffee ice cream until spreadable. Spread the ice cream over the frozen cake, and swirl to make pretty. Return cake to freezer until firm. Elegant, frozen dessert with a kick! Traci .....this is for you! !